The Clifton Lions are sponsering their annual pancake breakfast fundraiser in CPC's Fellowship Hall on Sunday, April 28th, from 7:45 am - 1:00 pm. The Clifton Lions are an active service organization in the Clifton-Centreville area. 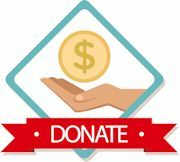 100% of all donations are passed on to charitable organizations CPC supports. They include Life with Cancer, Therapeutic Riding Center, Boy Scouts, Lions Youth camp and many more. Come and enjoy some home cooked pancakes and share fellowship with friends and neighbors! "Final Words From the Cross" by Adam Hamilton. This study continues each Tuesday morning, at 9:30 to 11:00 am. In this inspiring book, Adam Hamilton examines Christ’s dying hours and his final words as seen and heard through the eyes and ears of those who stood near the cross. Moving through each chapter you will begin to understand and respond to Jesus’ final words at the cross. In the final chapter, Hamilton moves beyond the cross to Jesus' words to the disciples on the road to Emmaus and to those who were witnesses to the Resurrection. All women are invited to learn and study together! Table Time is CPC's monthly inter-generational evenings of fellowship, service and fun. Join us on Wednesday, May 8 at 6:00 pm, as we share a meal together and participate in a service project. All are welcome! Visit our online bookstore at Cokesbury! Receive a 20% discount and support the church with a 5% rebate.